Recruit over 50 New Ambassadors for Dash. Engage over 200 bloggers to write about Dash in a competition, where the most viewed and shared will be paid Dash prizes. This will bring Dash awareness to more than a million people. Create a Dash gift card that will allow new users of Dash to be able to buy products on major e-commerce websites in Nigeria using Dash. Engage exchanges including ebitcoins.com and luno.com to trade Dash in Nigeria. Organize monthly seminars, summits and meetups. Create an office space to increase our public legitimacy. This will create new opportunities for networking and development of fruitful partnerships within the business sector. Proposal owner Ogunseye Oluwajuwon is a well-known and active member of Discord and the Dash forums, and leader of the Dash Squard team﻿, based in Nigeria. This 3-month proposal is escrowed by Dash Africa. Detailed budget figures are available below. A one-off payment is requested to facilitate monthly escrow payouts to Dash Squard based on achievement of well-defined milestones. We will remain in regular contact with both Dash Watch and Dash Force News to provide updates as to the progress of this proposal. Dash Squard have worked extensively to spread the word and encourage adoption of the cryptocurrency through all sectors and segments of Nigeria. The results have been extremely promising, but it is evident that this is only the tip of the iceberg. This proposal describes in detail our strategies, which include a permanent Dash office, mass marketing, Ambassador training and gift card initiatives. By proactively seeking to promote Dash during a pivotal time for cryptocurrency adoption both nationally and globally, we are confident that we can help Dash to become the dominant cryptocurrency in Nigeria. View the pre-proposal discussion thread on the Dash Forums here. Cryptocurrency adoption is soaring throughout Africa, with many of the continent’s unbanked using Bitcoin and other cryptocurrencies as a store of value, medium of P2P exchange and form of remittance. Cryptocurrency is particularly valuable in countries where the local fiat currency is susceptible to inflation, or where a vast number of the populace are unbanked. Nigeria is one such country. Like its sibling African states, Nigeria has a huge interest in cryptocurrency, with Google search data showing the country, along with other African nations, regularly topping the list for bitcoin enquiries. People in Nigeria aren’t just interested in hoarding cryptocurrency for its speculative value: it’s empowering them to gain their financial freedom, start their own businesses and free themselves from the yoke of government control. Dash Squad is a group of developers, analysts and marketers who are passionate about cryptocurrency, and Dash in particular. We believe that the cryptocurrency revolution has only just begun in Africa and Nigeria specifically and we see Dash as being at the vanguard of that movement. Bitcoin, for all its brand recognition, is expensive to send, making it unsuited for P2P use in countries where the average worker earns less in a day than the cost of an average BTC transaction. Ethereum is precluded for the same reasons; while not as costly to move as BTC, ETH transactions are still priced beyond the means of the average Nigerian, and the network also suffers from scaling problems that can cause it to slow down at peak times, which is not ideal for anyone reliant on using Ethereum to exchange goods and services in near real-time. It is our view that Dash is the cryptocurrency best suited to making inroads into Nigeria, and Africa as a whole. It is a coin whose characteristics are tailor-made for the sort of solutions Nigerians are seeking in a cryptocurrency: transactions are fast and cheap, the network is secure, the price is stable, and there is the option for private transactions. These attributes make Dash ideal for use as both a store of value and medium of exchange in Nigeria. Dash Squard are now seeking funding to raise awareness of Dash throughout the country and help it become the country’s preeminent cryptocurrency. Thanks to Nigerians’ demand for fiat currency alternatives, there is a unique opportunity for Dash to gain a foothold in the market. We believe that via an extensive programme of education and promotion, it will be possible for Dash to position itself as the country’s most popular cryptocurrency. If achieved, this in turn will have a knock-on effect in neighboring countries, and could potentially reverberate throughout the continent, giving Dash a seat in the heart of the world’s second largest and second most populous continent of 1.2 billion people. Working without a treasury budget, and armed with little more than enthusiasm for the transformative power of cryptocurrency, Dash Squard has made great strides to date. We have been spreading the word about Dash for months, and the results have been extremely encouraging. Person by person and village by village, we have seen awareness and adoption of Dash increase. Our efforts have seen stores and business places accept the cryptocurrency as a medium of exchange, with Gidicoin.com one such example. Introducing Dash to over 300 military personnel as a solution to the cross-border transaction limitation currently experienced in Nigeria. Organizing more than 20 successful meetups/seminars/conferences attended by over 1,500 Nigerians both online and face-face. Hiring professional translators to help our educational blog reach the unbanked and local indigene. Examples can be viewed here, here and here. Assembling a team of programmers to aid with Dash being used as a medium of payment via mobile apps and websites, Gidicoin.com being one of the most successful projects. Establishing the first ever grocery shop, boutique and a barber’s salon to accept Dash in Nigeria. Being the first group to speak about Dash at a Nigeria blockchain conference which was organized by Cryptography Development Initiative of Nigeria (CDIN), Blockchain Nigeria User Group, founded by Chimezie Chuta. 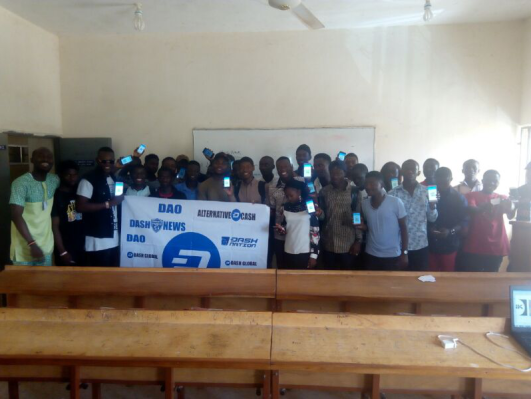 Getting over 800 new Dash wallets to be created in Nigeria, a feat which was acknowledged by Dash Force News. Getting over 800 new Dash wallets to be created in Nigeria, a feat which was acknowledged by COINTELEGRAPH and CRYPTONA.CO with over 68,000 views and 400 shares on all social media. Hosting a Dash music and cultural festival with over 700 attendees where all music artists were paid in Dash and vendors sold their food and merchandise with Dash. Dash Marathon: An initiative designed to raise competent and well informed dashers to spread knowledge of the financial revolution and the use of Dash across cities. Dash 101 (Translation): In order to reach more indigenous citizens, we’re translating the basics of Dash and also its white paper into three major languages (Hausa, Yoruba, and Igbo). Dash Squad have worked tirelessly to spread the word and encourage adoption of the cryptocurrency through all sectors and segments of the country. The results have been extremely promising, but it is evident that this is only the tip of the iceberg. There’s a huge untapped market in Nigeria for Dash and cryptocurrency in general. Utility: Dash, like most of the major cryptocurrencies, is now seen primarily as a store of value. We want to change that. With Bitcoin and Ethereum crippled by fees, Dash is primely positioned to capitalize on this and establish itself as a medium of exchange. Getting merchants to accept Dash is an arduous process in countries where legacy financial payment processors such as Visa are deeply entrenched. Nigeria is much more nimble, with merchants happy to seek alternative payment solutions if there is a clear benefit to doing so. We believe we can convince a significant number of merchants to accept Dash, which in turn will generate positive press coverage about ways in which Dash is being used as a utility, further accelerating its adoption, and enhancing the perception of Dash as a cryptocurrency for everyday use. Adoption: Despite our best efforts, the majority of Nigerians are still unaware of Dash and the cryptocurrency revolution that is taking seed throughout Africa. To achieve our goal of seeing Dash accepted as a utility by merchants, we need the cryptocurrency to be adopted by as many people as possible. This means encouraging wallet downloads and installations of apps with Dash functionality. 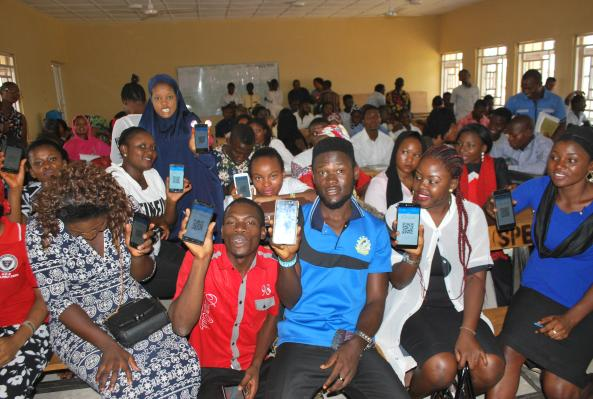 Like Africa as a whole, the vast majority of Nigerians access the internet via mobile devices, so engaging with mobile users is vital. The more Dash users there are and the better informed they are, the more pressure there will be on merchants to start accepting Dash as a means of payment. DashCart will be a Dash only gift card exchange that sells gift cards for various ecommerce markets such as Jumia, Konga, Olx, Payporte and Uber. We will start with just two cards, Payporte and Jumaii, before rolling out additional cards for other markets. We see DashCart as being the key to onboarding non-crypto users, as well as existing users of other cryptocurrencies. The DashCart website will be the first of its kind in Nigeria: at present there is no means for anyone to purchase products from popular sites such as Jumai with Bitcoin or Dash. We’ve examined the figures for Nigeria’s booming ecommerce industry and see huge potential for a service such as DashCart to bring in crypto holders in their droves. In 2016, Nigeria recorded over $2 million of online transactions per week and close to $1.3 billion monthly. The country’s ecommerce sector is growing rapidly, with estimated growth of 25 percent annually. Nigerians are notorious for their love of shopping, with Euromonitor Nigeria reporting that Nigerians spend $6.3 billion per year on clothing. A recent survey by Philips also found that 38 percent of Nigerians purchase products on the web. Careful consideration has been given to the selection of Konga, Jumia and Uber as the first ecommerce sites to link to Dash gift cards. Konga.com is an award-winning ecommerce site that sells gift vouchers to customers for as low as $2. It provides an option to purchase multiple gift cards in batches, which can then be resold to Dash users. Jumai.com.ng is another award-winning ecommerce site that sells gift cards to customers. One of the primary reasons for selecting Jumai is that they offer a wide range of ecommerce services including electronic top-ups, electrical bill payments, DSTV subscriptions and betting tickets. They also cover such things as food tickers and medical bills. DashCart.io will be developed in conjunction with our lead developer Sam, whose track record speaks for itself, and with a reputable software development company that was recently funded by Facebook. This will be an initiative that seeks to foster Dash professional advocates. These will be individuals from all walks of life who will serve as ambassadors for Dash. Bloggers, journalists, creative idealists, marketers, developers, doctors, lawyers, soldiers and law enforcement with the right professional character and enthusiasm for all things Dash will be encouraged and educated in ways they can help spread the word. We will equip these influencers with the right tools and training to ensure sure they can talk about Dash and advocate its use while spreading concrete facts and truths. One of the benefits of training these individuals through Dash Academy is that they will then be positioned to arrange and organize seminars for other people in their field. Thus the benefits of inducting a lawyer or soldier into Dash Academy will have far-reaching effects throughout these professions. After the crash course they will be given a DASH starter kit:the starter kit is the first step into the fascinating world of dash. It enables an easy introduction to the materials and allows you to create your own secure dash wallet and to transfer your first dash to it. The starter kit contains all the components and instructions you need to this end. Our dash booklet with a comprehensive, easy to understand introduction to the topics. On completion of their training, we will direct new Dash Academy graduates to Dash Force's merchant adoption program. We also intend to offer Dash monthly base workshops for merchants, which will encourage startups and entrepreneurs to share their expertise, helping Dash Academy attendees to gain, not only knowledge about the cryptocurrency, but also practical skills that will make them more effective at hosting Dash-themed events and business ventures. Nigeria is blessed with an army of bloggers who furnish their fellow countrymen and women with breaking news, trends and opinion pieces. There is a plethora of financial, economics and business bloggers in the country with a sizeable readership and great influence. We will be introducing them to a cryptocurrency-focused writing competition that’s centered on uses for Dash. To participate, writers must publish the post on their blog and share it on their social media channels. The winning submission will be judged according to its quality, number of shares and originality. We will also sponsor the annual Nigeria Facebook writer competition, which has over 5,000 active followers. This is a great way of getting the cream of the country’s bloggers writing about Dash, and the winner will have the opportunity to work alongside the Dash Nigeria team moving forward. We believe there are key advantages to obtaining office space in Nigeria from which to operate, including the increased legitimacy this will give Dash and the opportunities it presents for networking and developing fruitful partnerships within the business sector. Having a professional environment in which to receive visitors, host events, and run educational initiatives will validate and reinforce Dash in Nigeria with prospective business partners. We would look to set up an office in the heart of Lagos which is the market hub of Nigeria. It is here that the tech and business sectors can be found.A view of the office can be found here. A detailed spreadsheet US-dollar of costs is available HERE. Monthly escrowed payments of 26.84 Dash will paid by Dash Africa in accordance with monthly milestone completion. The foregoing initiatives represent the crux of our plans for helping Nigeria spearhead Dash adoption throughout Africa. Based on the groundwork that Dash Squard have already put in, we have seen the appetite that exists for cryptocurrencies and Dash in particular. Every member of the team is passionate about the emancipating power of cryptocurrency, and has witnessed first-hand the ways in which it has already changed the lives of Nigerians for the better. We will ensures complete transparency and accountability. 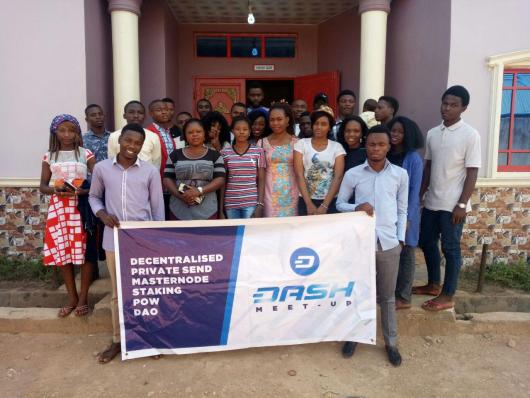 By proactively seeking to promote Dash during a pivotal time for cryptocurrency adoption nationally and globally, we are confident that we can help Dash become the dominant cryptocurrency in Nigeria. Alternative cryptocurrencies such as Bitcoin, which lack the framework or organizational structure for such initiatives, are unable to compete in this manner. Nigeria’s demand for cryptocurrency is growing daily. Project Two Million will meet that demand, and help Dash gain a crucial foothold in the country. In the process, it will become a multi-purpose asset that is suitable for a multitude of everyday uses: a cryptocurrency for the many, and not just the few. About 1day left for proposal closure. Let's make this pass, DASH to Africa is the intiative and more adoption is this project focus. This proposal is well written and I can see competent minds behind it @ogunseye oluwajuwon and @dashingdude have track records of achievement from Africa for DASH. Collaboration is paramount as Africa offers great potential for DASH first continent as we work together to achieve it. Wish you good luck in this, I love what you're doing in Nigeria. The scope of this proposal is extremely wide -- more than I can grasp, actually. The goals are too many to all be executed well. I'd encourage you to start with just one or two things, and become very good at them. Then consider branching outward. @n00bkid We divided it into TWO Adoption and Utility: Adoption (academy, writer competition and then a office space to create a legitimate space for new dash folks to come ask questions and also to run our programs) Utility(the dash gift cart: we have done over 30 meetups and have opened over 700 new dash wallet for Nigerians. Many of them want to spend their dash to buy cloths,food,electronic devices and also pay for services but they cannot, they kept complaining to us so we felt it is imperative to have a gift cart exchange so new users of dash can spend their dash on major e-commerce site) We where the first to start up an exchange in Nigeria that sell Dash, we gave over 6 exchanges in Nigeria money to list Dash on their exchange and we intend to add two major ones which is luno and ebitcoinic. We have been working for Dash for over two years so starting small isn't the issue because we have started very small. From 3 persons in our meetups to more than 700 people. Kindly go through our website or links above from cointelegraph and dash force news and see what we have achieved with the help of Masterminded, Joel Venuezela, Albert, Jza and the whole of Dash Nation who have contributed to some of our outreach. As i said ealier MOST OF THE GOALS ABOVE HAVE BEEN EXECUTED WELL WE ONLY NEED TO ADD MORE TO IT. 1. We spoke to over 300 Nigeria Military men. we where rejected 6 times before finally accepting us because of our drive to make sure Nigeria soldiers can send money to their Family as cross border transaction was a major issue. They where preparing for Peace keeping as at that time. 2. We have added over 10 merchants who accepts dash now. So the academy above will only make us train them properly and do more for the dash eco-system. I presently live on dash alone: we have barbers, boutiques owners, groceries stores, one primary school and Harmony hospital in Kaduna who accept Dash. Go through the site above. 2. We created gidicoin exchange which was the first exchange that accepts dash in Nigeria out of the zeal in us to work for Dash. so creating a dash gift cart will only help us replicate what we did on our exchange. 3. Office space: i and my team mostly use different halls and event center to organize seminars, meetups and summit for Dash with the help of Dashforce. They kept helping us with funds. 4. We have contacted anypay.global so as to add our local currency which they have accepted already we also have uphold to help our merchants easily convert their dash to fiat so they don't get burnt by crypto volatility. 5. This month we have organised over 13 meetups for our dash marathon. 6. We have a blog already and we have two professional writers with us. The Facebook competition initiative started with us and so we have writer who we have tipped Dash severally. Note: we are VERY GOOD at what we do i will plead with you to reconsider your "NO VOTE" and VOTE YES as our proposal aims at ADOPTIONS AND UTILITY no more no less. We started with Dash Force first and now that we needed more funds we had to raise a proposal. Exactly one week more, I think we can still make this one hit the roads. It is one the best proposals that has actually kept a while here. Let’s give this proposal a pass. Also this group has done a lot so far with Dashforce support, more can be done if we support them. Dash africa escrow? Never heard of them. Can you tell us more about who runs it? Hi Wixamlee. I hope that you are familiar with my handle - @DashingDude. I am re-posting most of my reply to the same question, posed earlier, from @mastermined. I run the dash-africa.com website from South Africa and was the first in Africa to begin Dash activism. I have previously assisted many African teams with their proposals , thus escrow for small propoals is a natural extension to what I do already. I hold a position of trust. The other Dash escrow providers are aware of my activities, and do not object because I am fulfilling a niche need in the Dash ecosystem. If you would like to know more, contact me on Discord or the forums. MNOs, please vote fairly on this proposal, as it would be unfair on the Proposal Owner if your vote was affected because you don't know me. Thanks! Voting abstain for now. Escrow should be impartial. Not sure if dashingdude fits the bill.. I think I'd prefer to see DashMaximalist's approach to expanding in low-cost/user areas like this. Abstaining for now. Thanks for posting. "this sounds fantastic for the amount of dash that is being requested, Voting Yes, make Dash proud guys !!" Voting YES. Please spread the word about the Dash.red website in Africa! Thank you for voting YES and we will definitely do that. I’m writing to you and the community as a whole. I understand that many of you bought into Dash because you see it as a potential winner in the crypto space and that you can earn a steady income from running a node. The budget system is great, only as a business person, you don’t see the value of some of the apparently wasteful things that have been supported in the past, and you are going to do your darndest to put a stop to it! I appreciate that. Many of the things Dash has done don’t make economic sense. I keep hearing about the Rate of Income, and that we’re not seeing sufficient returns on some of the proposals. Unfortunately, I don’t think you understand what you signed on for. Please let me explain. The cryptocurrency movement started by the unknown Satoshi Nakamoto, is a declaration of war against the incumbent banking system. There is no sweeter way of saying it. Of course nobody wants actual war, or any type of violence, however the incumbent system has utterly failed the people of the world in so many ways, and are undoubtedly the cause and source of all the wars around the world; the proof of which would be far too long a book to write here. This war can only be won Gandhi style, Martin Luther King Jr. style. We must win the hearts and minds of the world. We must grab as big a foothold in countries who have been decimated by bad governments and bankers. What you signed on for here is not a “business” that runs a balance sheet and must show profit. You signed on to a war. If you have not noticed yet, The IMF’s Christine Lagarde had declared the need to “control cryptocurrencies”. The good news is that they can not, ultimately, control them. They can however block fiat access which would be a huge slowdown in adoption. You see, when Satoshi Nakamoto launched Bitcoin, he knew he already won the war. However, there are still battles to go through. They will not change the ultimate outcome, but they can cause a LOT of misery; probably even death, as it’s obvious that those in power will do anything to keep it. It does NOT have to go this way if we play the game of Chess well. They’re on the defense. Lets keep them there! So what do we need to get us through these battles as unscathed and solid as possible? We need two things. We need to win hearts and minds of the people of the world and we need to get footholds in large areas where people use cryptos in daily life, not fiat. For this, Dash is the best tool, but the crypto community as a whole needs to band together to make this work! And because of our budget, Dash is in the best position to lead this charge. If you have not noticed, the media is fully controlled by the governments today. There is no more freedom of the press anymore, except for small independent groups and individuals. Today’s mainstream media is pulled by the very same strings; not left, not right, none of that is even real. Who in America that isn’t brainwashed or mentally ill, really hates blacks, whites, browns yellows and purples? You really think “white” people care what color skin another person has? I’ll tell you, not any more than a black or brown or purple person is likely to hate a white or other color person. No, it’s a tool to divide and conquer. Birth control, abortion, wages, race; it’s all fodder to keep the people incensed and impudent. Nothing changes no matter who is in charge. By supporting projects like The Free Thought Project, Ben Swann, and the crypto show (and their humanitarian aid arm) and more, we develop a relationship and allies. Our funding can empower free media, and in return we can expect that they will tell the truth about crypto. This is the absolutely best way to win hearts and minds in my opinion because even the most average of humans in the United States feels manipulated and that something isn’t right in the media, even if they can’t put their finger on it. If we can increase the reach of Truth in Media or any other such project, it will be the best tool we can hope for in this war. Also, the importance of what we do in Venezuela and other South American countries, plus what we do for many countries in Africa cannot be under estimated. These are Dash’s and crypto’s foot holds. There is so much potential in Africa and South America, and digital currencies will free that potential. If you don’t know by now, you should know that it is corrupt banking or lack thereof that keeps the people in these parts of the world from participating economically in the world. If we get a real economy working in these parts of the world, these countries or areas have no debt, no love of western banking. They will be whole heartedly crypto. And nobody will be able to change that. Either we win, or we drag this out forever, until the corrupt institutions of the world find a way to co-opt everything the crypto community have been trying to build. We look at the bottom line for what Ben Swann’s rate of return cost per click was, or we back media because it represents freedom as does cryptocurrency. We build a trust relationship with hard working young people in Africa, who are grass rooting their country and soon catapulting it to the top of the food chain, or we leave them and their potential high and dry because pictures aren’t enough proof, there “could” be waste in how they are functioning, or god forbit they “take us” for a dash or two. I don’t even think they’d ever even do that, they’re full of so much zest for building an economy in their homeland, but the narrow-minded fear we seem to have is starting to become irrational. If you haven’t guessed by now, this letter to you, the Dash community is a request to support and vote for all the African, Venezuelan, Benn Swann, Truth in Media proposals because we NEED these people to win! Thank you so much for reading this and I apologize for posting this everywhere, but that is my intention. "Working without a budget, and armed with little more than enthusiasm for the transformative power of cryptocurrency, Dash Squard has made great strides to date. We have been spreading the word about Dash for months, and the results have been extremely encouraging. Person by person and village by village, we have seen awareness and adoption of Dash increase." Just to be clear, hasn't Dash Force sponsored most of the events listed? We have sponsored so many I can't keep up but I did not see Dash Force mentioned and I thought we were involved, I personally remember helping negotiate and paying for at least a few if not almost all of those events. Fair comment - the Dash Force funding should have been acknowledged. Apologies. The proposal owner would like to keep Dash Force involved in this project in future. Am so sorry. if you have clicked on the links we provided from "Dash force news" you will see that we clearly acknowledge the support from Dash Force and both You mastermined and Albert. We are grateful for your constant support for Dash projects in Africa and Nigeria. There is no time i PM you for any project that am supposed to embark on that you do not respond swiftly. Before i droped this proposal i had to send it to you and Joel (Thedesertlynk) so as to get your feedback. You are indispensable. When i wrote ""Working without a budget" i was referring to dropping any official proposal that have been funded. A glimpse at our twitter timeline will testify that we have constantly acknowledge the effort of Dash force news on our work in Nigeria. And for you to know i and my team will constantly remain in contact with Dash force and dash watch to provide updates as to the progress of the proposal. We will also direct new dash academy graduates to dash force's merchant adoption program. On behalf of the Dash Squad, we apologies. Bottom line, none of these third world projects have helped the price of Dash. Voting NO!!! So much is wrong with this comment. What does the price of Dash have to do with it? You want to make fast money? or do you want to change the world? There will be nothing more important to the future of Dash than actual adoption, and regions that are desperate for banking are the most likely to actually adopt crypto currencies. In my opinion, you are extremely short sighted. What differentiates Dash from the other coins, is that we are the first true digital cash. You see, investment is just one use-case, but digital cash is a different use-case. We have the advantage of being first-starter, so Dash really needs to push for adoption in regions that are likely to be receptive such as much of Africa and Venezuela. The ROI will come later, if we can make mass-adoption start happening on the ground. These sort of third world projects are starting to make that happen. this sounds fantastic for the amount of dash that is being requested, Voting Yes, make Dash proud guys !! Yes! we will make Dash Proud. Thank you for voting Yes. Hi Mastermined - I, DashingDude, am providing escrow for this proposal under that name. Cheers! Hi! I run dash-africa.com from South Africa and was the first in Africa to begin Dash activism. I have previously assisted many African teams with their proposals , thus escrow for small propoals is a natural extension to what I do already. The other Dash escrow providers are aware of my activities, and do not object because I am fulfilling a niche need in the Dash ecosystem. If you would like to know more, contact me on Discord or the forums. MNOs, please vote fairly on this proposal, as it would be unfair on the Proposal Owner if your vote was affected because you don't know me. Thanks! You have a good track record and I like the breakdown of your budget. Voting Yes. Thank you! We promise to make Dash proud.